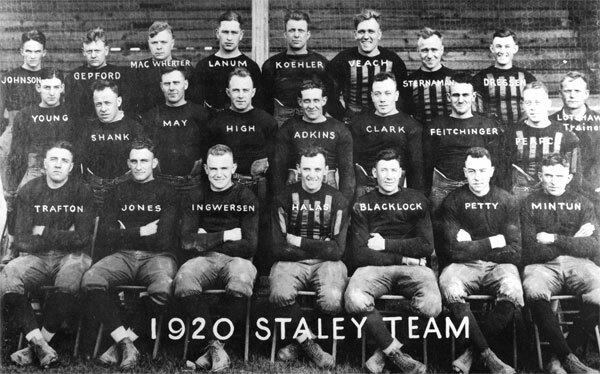 The Staley Football Club; also known as the Decatur Staleys or the Staley Starch Makers. Later became the Chicago Bears. One of A.E. Staley’s greatest achievements was his role in the creation of the Chicago Bears and the creation of the National Football League. Although Staley likely did not foresee the consequences, his competitive nature and desire to be the best set in motion a series of events that changed the face of sports in America. In 1919 A.E. Staley was gearing up for what would be his most prolific decade. This decade 1920-1930, would begin with the creation of the Staley athletic program and the beginning of the Decatur Staleys football club. Why would an industrialist like Staley would embark in the field of athletics? Dan Forrestal, author of The Kernel & the Bean: The 75 Year History of the Staley Mfg. Co. suggests several possible reasons. First he offers that Staley, having come from humble beginnings and having had very little formal schooling, missed out on the opportunity to participate either actively or as an observer in any kind of athletic program although his competitive nature indicates that he would have enjoyed sports. Another possible reason for embarking on an athletic program is the inherent lessons to be learned regarding sportsmanship. Staley surely must have thought that employees participating in sports either actively or as spectators would grow to value the lessons learned of being a team player, good sportsmanship, character building as well as building a sense of team/factory loyalty. Staley also might have regarded this as good, healthy entertainment for his employees who otherwise spent their days working in a town focused basically on industry. But maybe more than any other reason is the fact that A.E. Staley was an entrepreneur with big dreams. He wanted to see the Staley name and product line succeed. What better way to promote the Staley name than by an organized traveling sports team? It is probably safe to say that all of these factors came into play in motivating Staley to begin a company supported athletic program. The unfolding of the Staley football club and its development from a purely industrial team to a semi-professional and then a fully professional team begins oddly enough with a game that was played in 1919 against an area team called the Arcola Independents. The Staley team at that time was made up of regular Staley Mfg. employees who had shown interest in the sports program. In that first game against Arcola the Staleys won 41-0. The resounding defeat caused the businessmen of Arcola to rally and create a more competitive team before their next play date with the Staleys. Arcola contacted Dutch Sternaman, University of Illinois’s top running back and asked him to find players among the university sector to build a more competitive team. Dutch did build a team but when the day of the game came round, the Decatur Staleys were a no-show. A.E. Staley, having gotten wind of these dealings, would not send his team in for a dose of humiliation. The competitive entrepreneur in Staley asserted itself and Staley decided to grow his own semi-professional team. First he contacted Dutch Sternaman, the man responsible for putting together the Arcola team, but Dutch was close to finishing his Mechanical Engineering degree at the University of Illinois and was not ready to make a commitment to an on-going sports program. 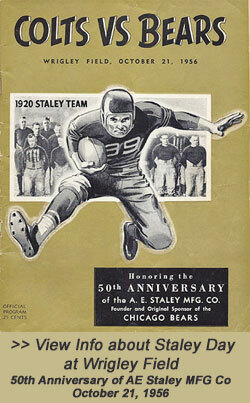 Staley then turned his sights to George Halas, known for his prowess in both baseball and football. Halas had played end on the University of Illinois football team and had then gone on to play with the Great Lakes Navy team during WWI. This team played and won the January 1, 1919 Rose bowl game against the Mare Island Marines. Halas then went on to try his luck at baseball. He tried out and was contracted by the New York Yankees but was injured in an exhibition game against the Brooklyn Dodgers. This injury would keep him out of major league baseball. He ended up taking a job with Chicago, Burlington & Quincy (CBQ) Railroad. It was at this time that A.E. Staley sent his general superintendent George Chamberlain to meet with and make an offer to George Halas. Halas was hired by Staley to coach and play football as well as play baseball under the management of former major league baseball pitcher, Joe “Iron Man” McGinnity. Halas was paid a weekly wage of $50. In the summer of 1920 George Halas went out on what some have called “the first professional football recruiting journey in history.” When Halas returned he reported to Staley that he now had a team that would draw standing room only crowds. The agreement with the recruited players provided that they would enjoy the stability of a regular salary based on their work week at the Staley Mfg. Co. Their work week would provide for two hours daily training as part of the football club. Additionally, they would receive a portion of the gate at the end of the season. Thus the “Decatur Staleys” were born. The Halas contribution to both Staley and national football did not stop here. On September 17.1920, Halas and Staley engineer Morgan O’Brien met at the Hupmobiles and Jordans showroom in Canton, Ohio with a group of men that outlined in the course of two hours what would become the American Professional Football Association, later the National Football League (NFL). It was at this meeting that Jim Thorpe was elected president. The formation of this association was an effort to adopt a single set of rules for the game which up to this time varied greatly from region to region. Viewing this leaps and bounds development in the course of only a few months, it is not hard to see how the situation quickly outgrew the industrial purposes at first imagined by A.E. Staley. The Decatur Staleys not only had a winning season their first year (10 victories, 1 defeat , 2 ties) but declared themselves National Champions. There was, however, some dispute regarding the title of champions. In a league meeting on April 30,1921, non-league games that had been played by teams were factored into the tally and the end result was the Akron Indians were awarded the championship. Still, the Decatur Staleys were happy with thier season’s results. The success of the team and growing popularity of the sport required Staley to rethink the football program. The problem that Staley saw was one of simple business sense — limited growth in Decatur versus the potential for growth in a larger market. The Staley field could only accommodate 1,500 seated fans with another 1000 standing. The price of tickets was only $1 and Staley employees paid half price. This was combined with the fact that in the 1921 season only two of the 11 games were played at home. Despite A.E. Staley’s immense pride in the team he had created, the popularity of the sport was growing and the potential growth of the team depended on it being moved to a larger city with a larger venue. Staley found himself in the position of having to make a business decision. Was he in the corn processing business? Or was he in the blossoming business of professional sports? Staley met with George Halas and explained the situation and made Halas a proposition he could not refuse. Staley said that big-time football needed big city crowds. So it was agreed that in October 1921 the Decatur Staleys would relocate to Chicago and play at Wrigley field. They would retain the Staley name for one season. The 19 players on the roster would remain on the Staley payroll for the course of that first season and Staley agreed to pay the team a $5000 bonus to help with the move to Chicago. George Halas noted that Staley had no legal or moral obligation to promote the continuation of the football club. But Staley was a big man who understood big dreams and he saw the big potential in the team he had created. Staley would later go to games up in Chicago when he could and he referred to the now Chicago team as “the transplants”. At the end of the 1921-22 football season, it was time for the Staleys to change their name. Given that they were sharing Wrigley field with the Chicago Cubs, they decided to call themselves the Bears, arguing, tongue in cheek, that football players are larger in size than baseball players. In 1922 the Bears began their first official season. The rest is history. It is important to note that out of the original team several players have been inducted to the Football Hall of Fame. George Halas, was a charter member of the Football Hall of Fame in 1963. Also inducted into the Football Hall of Fame were teammates Edward” Dutch” Sternaman, Guy Chamberlin and George Trafton. Additionally, the manager of the Staley baseball team on which Halas played, Joe “Iron Man” McGinnity, was inducted into the Baseball Hall of Fame.